A circle is the locus of points that are a given distance from a given point. An ellipse is the locus of points such that the sum of the distances to two fixed points is constant. What is the locus of points such that the sum of the squares of the distances to two fixed points is constant? 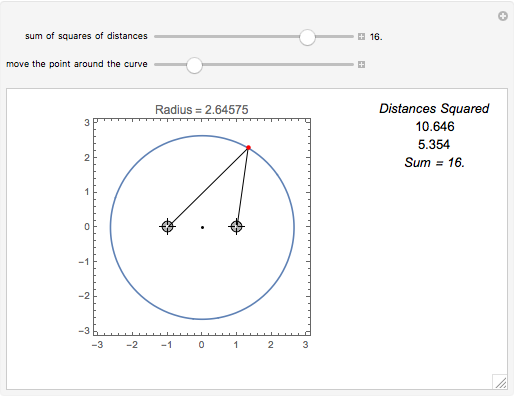 We often define a circle as the locus of points that are a given distance from a given point. The given distance is the radius, and the given point is the center. Likewise, an ellipse is often defined as the locus of points such that the sum of the distances to two fixed points is constant. The two fixed points are the foci. Suppose we tweak these definitions and ask, "What is the locus of points such that the sum of the squares of the distances to two fixed points is constant?" Assuming the sum is large enough, the locus is a circle. We can generalize this: if is any positive integer, a circle is the locus of points such that the sum of the squares of the distances to fixed points is constant (again, provided the sum is large enough). If the right-hand side of equation (2) is a number greater than 0, then the radius is the square root of that number. You can use Alt+Click to add more locators or to delete existing ones. This also generalizes to higher dimensions. For example, in 3-space, a sphere is the locus of points such that the sum of the squares of the distances to fixed points is constant. Robert Baillie "The Sum of the Squares of the Distances to N Points"